Few of us routinely think about our personal actions and the quality of our watershed. Why would we? We’re all busy, wrapped up in our daily lives. We don’t consider the impact of the bottle we saw on the ground, the trash that blew by or the soap we used to wash our car. Even though we may not be aware, our actions have a tremendous impact on the quality of stormwater. Many seemingly benign actions have a very real detrimental effect on aquatic ecosystems. Changing our behaviors is not hard, but sometimes we need a little reminder. Storm drain murals, as the name implies, are pieces of artwork designed to foster a connection between the viewer and the watershed. 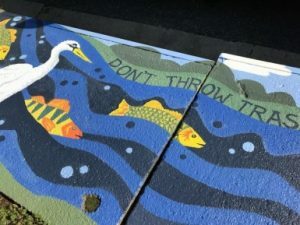 The murals, accompanied by actionable messages like “only rain down this drain” and “don’t throw trash where the fish splash” catch the eye of those who pass by. Regular viewing of these murals encourages us to be more self-reflective and consider a change in our ways. Maybe you make an extra effort to property dispose of that plastic bottle, run after the trash that blew by, and take your car to a wash where water is cleaned and recycled. The residents of Copeland Manor, a NHT-Enterprise property in SE D.C., recently participated in an artwork competition to design three storm drain murals. Residents were invited to submit concepts, slogans and sketches to inspire the final mural designs. The winning residents worked with a professional artist to transform their concepts into unique designs that reflected the personality of Copeland Manor and the residents who live there. In April of 2018 all three murals were painted onto the drains. NHT-Enterprise staff, Copeland Manor residents and a professional artist all worked together to create amazing pieces of art that will inspire change in the community for years to come. Now, when Copeland Manor residents walk through their community they will see beautiful reminders that their actions, good or bad, have a tremendous impact on the Anacostia River. The hope is that small individual changes will add up to a larger culture of environmental stewardship at Copeland Manor. This project was made possible by the Community Stormwater Solutions grant from the District Department of Energy and Environment. NHT-Enterprise hopes to expand its storm drain murals and environmental education efforts across it’s D.C. portfolio soon. A huge thank you to Maria Mandel of Creative Couch Designs and the residents and staff of Copeland Manor for making this project a smashing success!